Remember the Titans is the story about the racial integration of two coaches and a team made up of both black and white people. It’s a deep story with dealing with difficult topics like racism, discrimination and athletic. Ultimately, it’s about how group of people with diverse beliefs and backgrounds can come together to triumph — despite their differences. Like how Coach Boone managed the cultural and ethnic discrimination between the two camps, every good leader must recognize and manage the different expectations, beliefs and values of a team. He helps bring peace and resolves the conflicts with wisdom as they come by. A good leader demands excellence from his team. Besides just bringing the team together, Coach Boone never compromises on the standard he requires from his football team; a team that is strives toward perfection in their game. Toward the end, there was immense pressure on Coach Yoast to give up his belief of integration and unity of blacks and the whites, and to accept the tempting offer by the school board. As a leader, you’ll always face immense pressure from the power players and this is usually the crunch time where you will have to choose between doing what’s right, and what’s popular or socially accepted. Here are a few of the best leadership-related quotes that we liked from the movie. We will be perfect in every aspect of the game. You drop a pass, you run a mile. You miss a blocking assignment, you run a mile. You fumble the football, and i will break my foot off in your John Brown hind parts and then you will run a mile. Perfection. Let’s go to work. All right, now, I don’t want them to gain *another yard! * * You blitz… all… night! * If they cross the line of scrimmage, I’m gonna take every last one of you out! You make sure they remember, *forever*, the night they played the Titans! I’m not gonna talk to you tonight about winnin’ and losin’. You’re already winners ’cause you didn’t kill each other up at camp. People say that it can’t work, black and white. Here, we make it work every day. 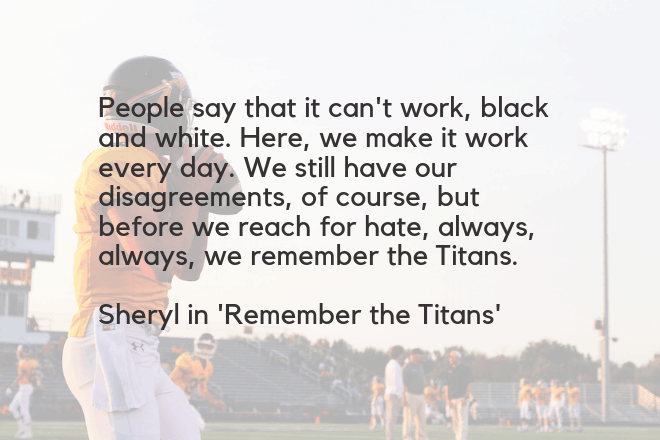 We still have our disagreements, of course, but before we reach for hate, always, always, we remember the Titans. I’m a winner. I’m going to win. I don’t care if you like each other or not, but you will respect each other. Ronnie “Sunshine” Bass: I can’t make that pitch Coach. You can find out more about other leadership movies from the list below.